Photo: John Pulcipher House, ca. 1883, 7710 US Route 31 North, Acme Township, Grand Traverse County, MI. Listed on the National Register of Historic Places in 2000. Photographed by User:Andrew Jameson (own work), 2010, via Wikimedia Commons, accessed August, 2013. Grand Traverse County administrative offices are located at 400 Boardman Avenue, Traverse City, MI 49684; phone: 231-922-4700. 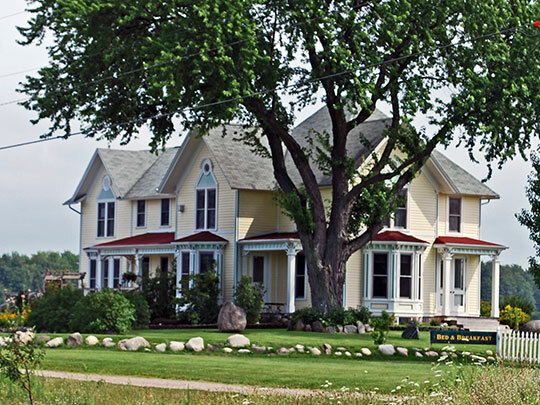 Originally part of Mackinaw County, Grand Traverse was incorporated in 1851. The early French voyagers, in coasting from Mackinaw southward found two considerable indentations of the coast line of Lake Michigan on the east side, which they were accustomed to cross from headland to headland. The smaller of these they designated La Petite Traverse and the greater La Grande Traverse. These names were transferred to the two bays known as the Little Traverse and Grand Traverse, from the latter of which Grand Traverse County was named. For many centuries prior to the settlement by whites the entire region about Grand Traverse Bay was and on the borders of Lake Michigan had been inhabited by Indians. According to the most reliable traditions the Indians of the region first acquired possession of the area around 1600. From the autobiography of Alexander Henry, the first English fur trader who ventured among the Indians at Mackinaw, we get the first mention of Grand Traverse, although there is good reason for believing that Jesuit missionaries had visited the region all along the shores of Lake Michigan and its bays. It is believed that Father Marquette and his co-laborers called the bay Le Grande Traverse. Little is known about occupancy of Grande Traverse from the time of Father Marquettes death in 1675, up to the massacre of Fort Mackinaw in 1763. Reverend Dr. Morse, father of the inventor of the telegraph, visited Mackinaw in June 1820. He became interested in the condition of the traders and natives and made to the United Foreign Missionary Society of New York, a report of his visit, the result of which was that Reverend William M. Ferry was sent in 1822 to explore the field, which resulted in the establishment of a school that was kept up until 1837. At this time the Indians had permanent settlements at various points in the region. There were gardens on the peninsula in Grand Traverse bay and a village at Old Mission, west of the Bay in Leelanaw County. In May, 1839, Reverend John Fleming and Reverend Peter Dougherty, missionaries of the Presbyterian Board of Missions, having spent the previous winter at Mackinaw, came to Grand Traverse Bay to found a school for the education of the Indians. They brought supplies with them including doors and windows for a house. A house was built at Elk Rapids but later taken down. About 1842 Mr. Dougherty built a dwelling since known as the mission house, which was the first frame building erected in what would become Grand Traverse County. Elvin L. Sprague, Esq., and Mrs. George N. Smith, Sprague's History of Grand Traverse and Leelanaw Counties, Michigan, B. F. Bowen, publisher, 1903.